Wheatberries, wheat kernels minus hull, are a great little secret. They’re crunchy, a pretty tan color, and have a rich, almost nutty taste. Unfortunately, they are also currently out of stock in the two grocery stores that I checked, so I made a couple changes to tonight’s dinner plan. In lieu of wheatberries, I used farro, an ancient grain known for its nutty flavor. Farro is lighter in color than wheatberries so the salad didn’t look as pretty, but it tasted quite good. Wheatberries also have a firmer texture than farro. 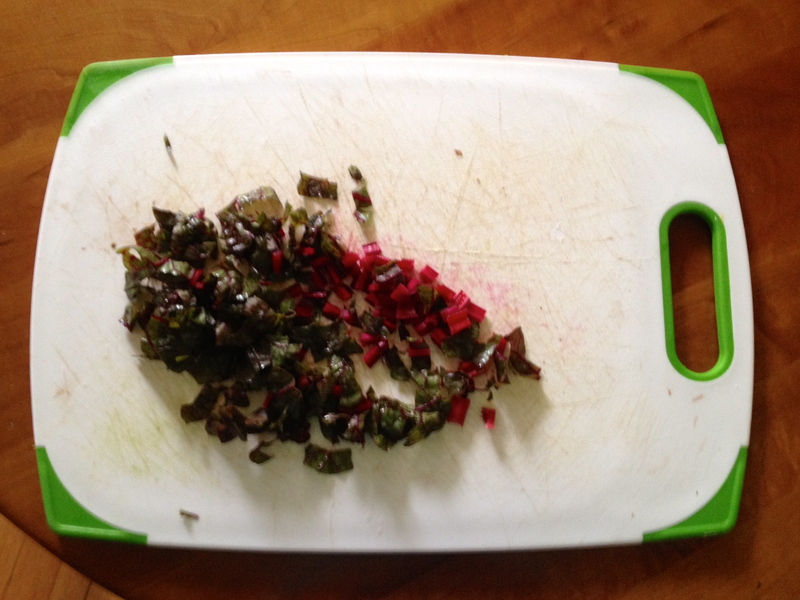 I also added Swiss chard to my salad because I had it in the fridge and used Quorn instead of chicken. As my mum wrote in the cookbook she made for me when I was in college, “Chicken is delicious in this salad, but not imperative . . . If you don’t use chicken, you may omit the thyme.” I included the thyme to flavor the Quorn. 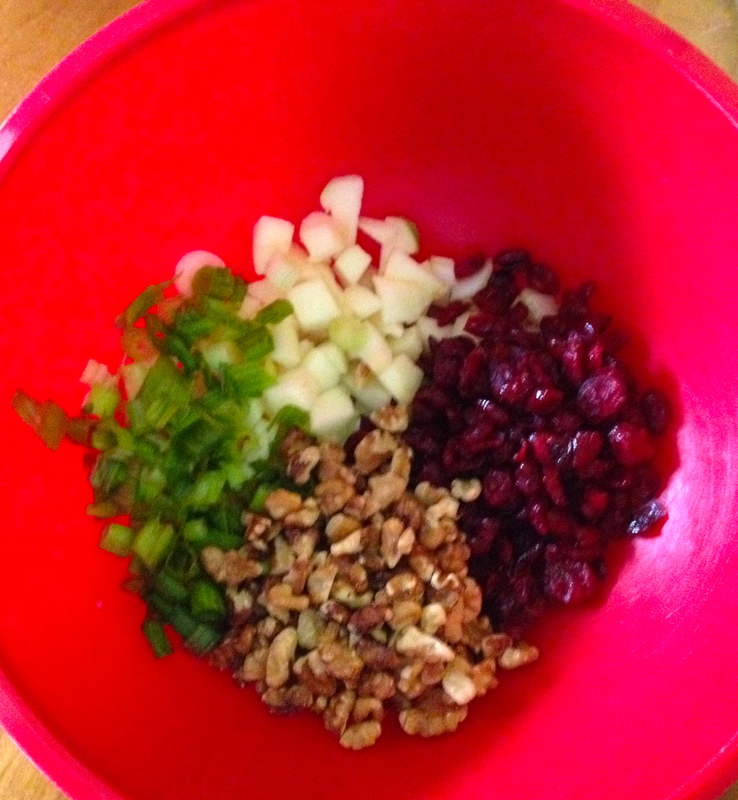 Some ingredients for my wheatberry salad – looks sort of like Thanksgiving in a bowl! 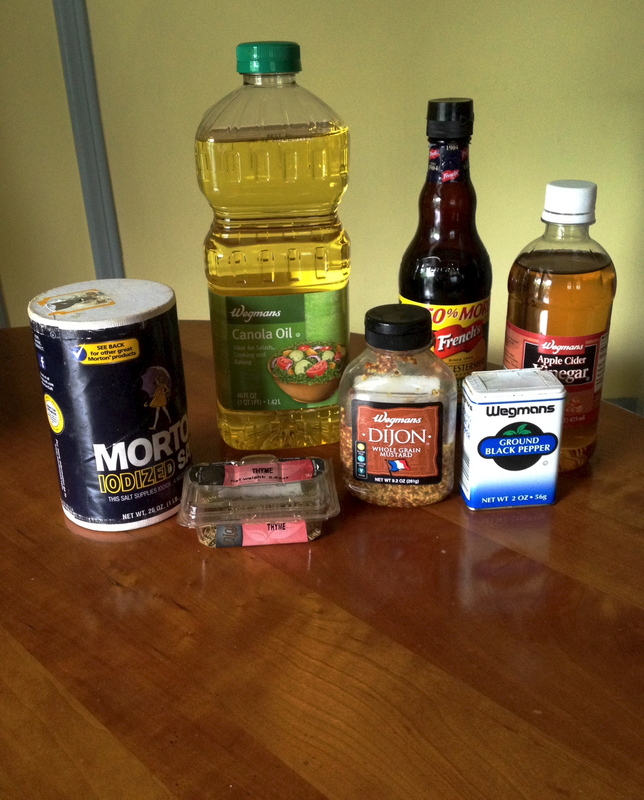 Now that you know all about tonight’s adaptation to wheatberry salad, let’s move onto the actual recipe, shall we? -Place wheatberries in a large pot; add water. -Bring to a boil over high heat. Reduce heat to low and simmer until tender (about 1 hour). -Place wheatberries in a large bowl; stir in remaining ingredients. -Serve cold or at room temperature. One final note: Making the salad as written above will serve about 10 people. No joke. It definitely acts as a meal and you’ll be eating it for a long time. Reader, you are now warned.